Castle® Manhandler™ is powered by pumice and is effective for the removal of grease, adhesive, paint films, ink, oil, tar, and grime. A blend of cleaners and surfactants clean while pure anhydrous lanolin conditions the skin to prevent chapping. Free of harsh solvents. 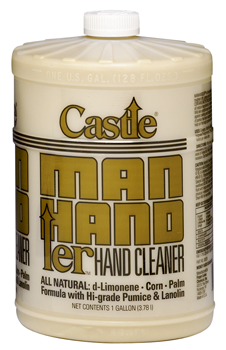 Manhandler™ contains no petroleum and does not clog drains or sinks. 1. Put a small amount in palm of hand. 2. Rub together briskly until liquefied. 3. Wipe off with towel or rinse with water.